Poor old Google Glass. Touted as the next big thing in wearable tech, the smart glasses from the search engine giant ended up falling on the pointy end of its own hype and was soon thrown on the fad heap with a drawn out sigh. 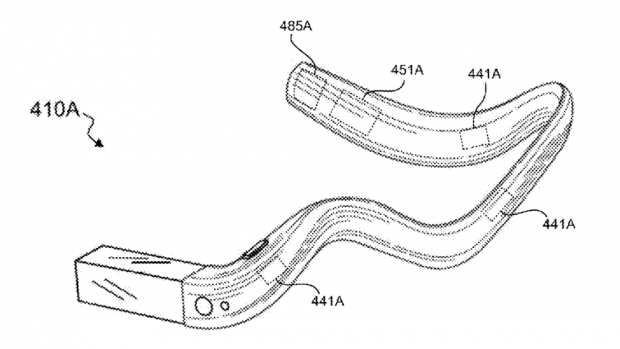 But if a new US patent is to be believed, Google is aiming to relaunch Glass with a funky new design that's more Bluetooth headset than smart specs. Of course, we don't know for sure it's Google Glass, but the ergonomic design and small single screen is unmistakably a Glass-y spin-off. The patent, which has now been granted by the US Patent And Trademark Office, shows a rather wiggly looking design, but we're not convinced an abstract aesthetic will be enough to shake the stuttering memories of its predecessor. Thankfully, rumours of its new features are far more intriguing. We hear the new version may have an integrated camera (which makes a great deal of sense considering the market it's aiming for) and it may even incorporate some new augmented reality features (think Microsoft's HoloLens headset, only with more Google). Why not check out: Win one of five pairs of Optima BE6 Bluetooth earphones worth £100!